This one is for anyone who has ever chased a full Italian main course with a Tiramisu that made you feel as if you might explode – but persevered with every last delicious mouthful! 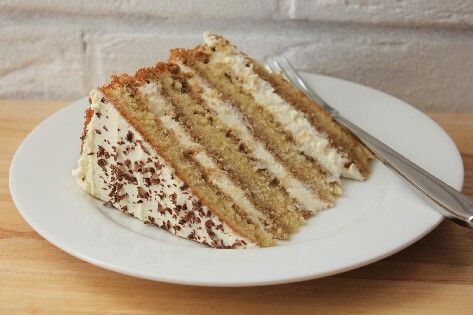 This cake is intended as a homage to the ultimate Italian dessert, best served in the afternoon with lashings of really good coffee and friends. Add the eggs slowly, throwing in a spoonful of your pre-weighed flour if the mixture starts to curdle. Add a good quality vanilla extract. Gently mix in the flour and baking powder until all is incorporate and you have a smooth batter at the same consistency as thick cream. Bake in a pre-heated oven for 30-40 minutes until risen and springy. Remove from the tins after 5 minutes and allow to cool completely on a wire rack before assembling. Whip the cream until it holds soft peaks. You are aiming for the cream to be firm enough to hold its shape in the cake but with still a light creamy texture. When in doubt, under-whip the cream as it will firm up. Gently fold in Amaretto to taste before loading the boozy cream into a large disposable piping bag. Split each layer of sponge cake in two. Remove any peak that may have risen on the surface of your cake in the oven and use a large, sharp knife, giving you 4 thin layers of sponge cake. Pour some of your cooled espresso coffee into a clean baking sheet and carefully lay one of your sponge layers in the coffee. If you leave the cake to soak for a few seconds, you will absorb loads of lovely flavour. Place your first layer of sponge with its coffee soaked side facing upwards on a plate or cake stand. 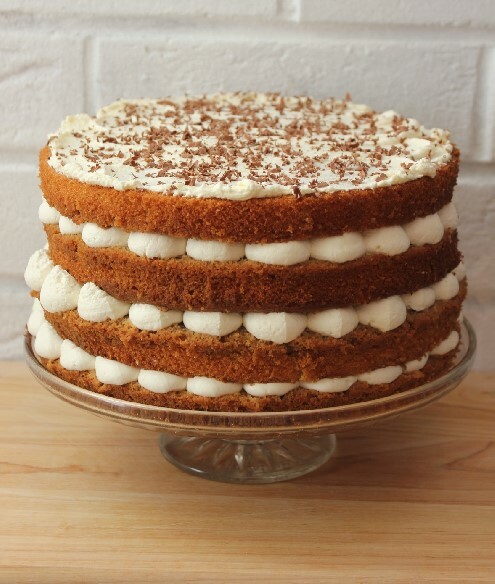 Pipe dots of Amaretto Cream around the outside edges of your cake layer (as this is the area that will show and we want it to look pretty) and pipe a swirl of cream in the middle of the cake to fill it generously. Take your next layer of cake and soak BOTH sides in espresso. You may need to top up the liquid in your baking sheet after each soaking as the cake will absorb it. Carefully lay this next coffee soaked layer on top of the piped Amaretto Cream. Repeat steps 8-9 until you have only one last layer of sponge cake unsoaked. Soak your last layer of sponge cake on its underside only and lay this carefully on top of the piped Amaretto Cream to top your cake. 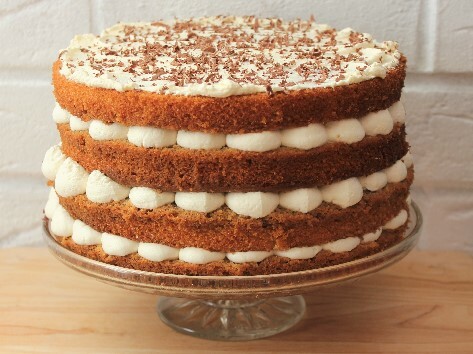 Spread any remaining Amaretto Cream on top of the cake and finish with a grating of dark chocolate.